This past week, Americans voted in the 2018 midterms. After two years of the Republican party controlling both branches of the U.S. Congress, they managed to maintain a majority in the Senate while the Democrats took control of the House of Representatives. Seats were open in both branches of the U.S. Congress, with 35 Senate positions and all 435 House of Representatives positions being up for grabs. Additionally, Americans voted for candidates to fill 36 governorship positions and hundreds of local legislative positions across the country. 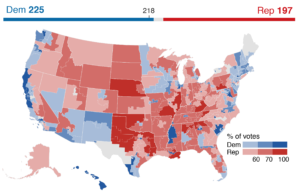 Democrats needed a net gain of 23 of seats in the U.S. House to take control, and they were able to gain 30 total. However, the Republicans were successful in maintaining their Senate majority, looking to build on their 51 seats. For comparison, Republicans gained 63 House of Representatives seats and 6 Senate seats in 2010, the first midterm election following Barack Obama’s 2008 nomination to the President. In contrast to the 2016 elections, Pennsylvania leaned blue as it re-elected incumbent Democrats Bob Casey and Tom Wolf, U.S. Senator and State Governor respectively. Casey received 57.6% of the state’s vote while his Republican challenger Lou Barletta acquired 42.8%, and Wolf beat opponent Scott Wagner with 57.6% of the overall vote in comparison to Wagner’s 40.8%. On a smaller scale, Democrat Jess King’s grassroots campaign fell short to incumbent Republican Lloyd Smucker as he maintained control over Pennsylvania’s 11th Congressional District, which includes Lancaster County. In Western Pennsylvania, Democrat Conor Lamb pulled off a victory over Republican Keith Rothfus to represent the state’s 17th Congressional District. Lamb received national attention for his special election against Rick Saccone from the previous spring, in which President Donald Trump endorsed Saccone. Lamb and Rothfus each represented a different district until the redistricting of Pennsylvania, and Lamb will now remain in office after receiving 56.1% of the vote. Across the country, several elected officials made history. For instance, Texas voted its first two Latina congresswomen into office, with Sylvia Garcia and Veronica Escobar being elected to serve in the House. Other first-time elections included Rashida Tlaib and Ilhan Omar as the first Muslim women in Congress, Teri Johnston as Florida’s first openly lesbian mayor, Jared Polis of Colorado as the country’s first openly gay governor, Sharice Davids and Deb Haaland as Congress’s first Native American women, and Alexandria Ocasio-Cortez as the youngest woman ever elected to Congress. Several national politicians and public figures made appearances on the campaign trail in an effort to swing the vote. Former President Barack Obama abandoned the precedent set by George W. Bush and Jimmy Carter, who removed themselves from politics following their respective presidential terms, by campaigning for and endorsing several Democratic candidates. On the trail, Obama pushed for more Democratic representation in Congress by telling voters that President Trump was threatening America’s democracy and safety through a lack of checks and balances and too close of a relationship with Vladimir Putin. President Donald Trump also joined several candidates on the campaign trail, speaking on behalf of Governor candidate Scott Wagner and urging voters to elect more Republicans to support his Presidential agenda. Now that the overall results are known, President Donald Trump is warning of a more divided country and Congress. Although he acknowledged that there were defeats for his party, he focused on bragging about the gains of the GOP. With the ongoing Mueller investigation and rising discontent within Congress, including the Republican party, Democrats will attempt to scrutinize President Trump and attempt to hold him accountable for more actions.